▲ Seogwipo World Cup Statium. Photo courtesy Jeju Special Self-Governing Province. Jeju United's first K-League game of the season will be against FC Seoul on Thursday, March 1 at 4 p.m.
Those looking forward to watching Jeju in action will be happy to know that the game will be a home game. The reason for the game being on a Thursday is that March 1 is Independence Movement Day in Korea meaning many people will have the day off. Last season, Jeju had one of their most successful season ever as they finished second in the league. However, despite a fifth-place finish last year, FC Seoul are traditionally one of the stronger teams in the league and they were the 2016 season champions. If you can't wait until March to see Jeju in action, then the first AFC Champions League game of the season will take place on Wednesday, Feb. 14 at 19.45. 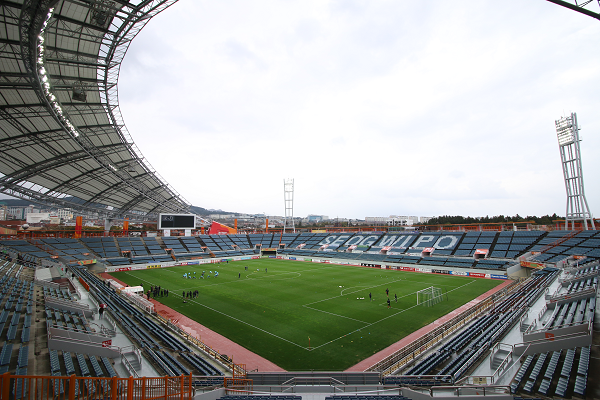 This will also be a home game at the Seogwipo World Cup Stadium.